Newer Model Available: ComfortLine Heated Tubing Kit.
" No more waking up in the middle of the night with water in your nose/face. " " We keep our house fairly cool at night, so we had significant rainout problems. This hose has solved the problem. " 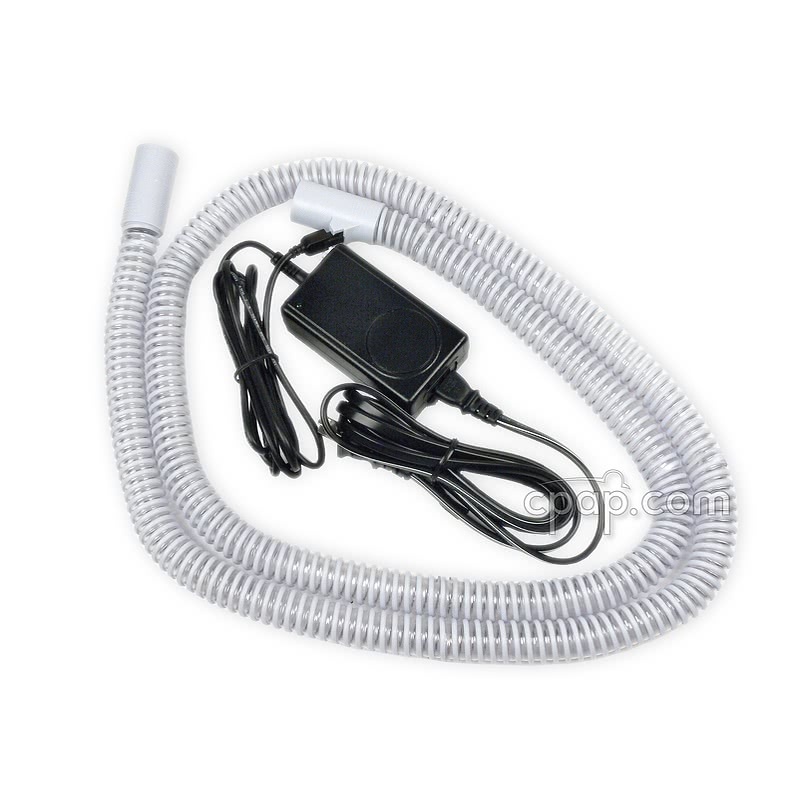 The Hybernite Rainout Control System is a stand alone option for reducing rainout or condensation in the CPAP tube. 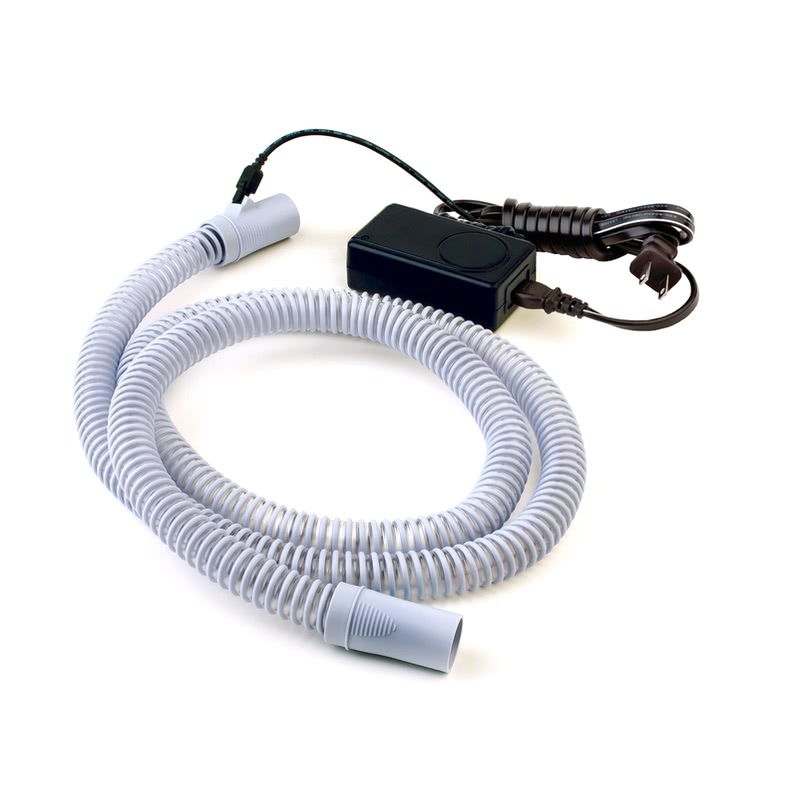 Unlike other heated hose options, the Hybernite can be used with any CPAP or BiPAP machine that accepts a standard tubing. Copper wires embedded in the walls of the tubing use its own power source to uniformly heat and prevent condensation by maintaining the temperature. Use the Hybernite Rainout Control System (ROC) to get the benefits of improved humidification and reduced rainout using any CPAP or BiPAP machines that accepts a standard tubing without the cost of upgrading the entire system! 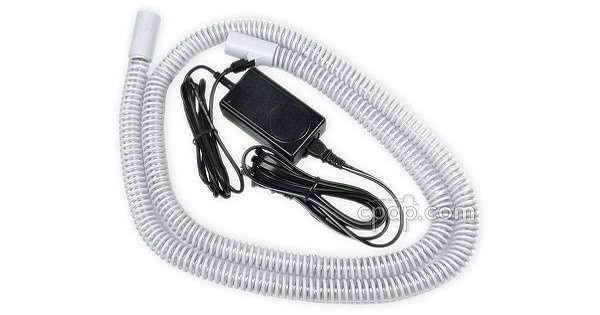 Using its own, medical grade power source, the copper wires embedded in the walls of the tubing uniformly heat along the length of the tube to maintain the temperature inside the tubing and prevent the humidified air from condensing as it travels from CPAP and Humidifier to the mask. To avoid rainout, CPAP users often makes changes that may compromise their therapy and sleep. These include reducing the humidification setting on their system, lowering it below the prescribed or desired level, and raising the temperature in the bedroom. The Hybernite ROC allows you to control the temperature inside the delivery tubing rather than the environment around it. 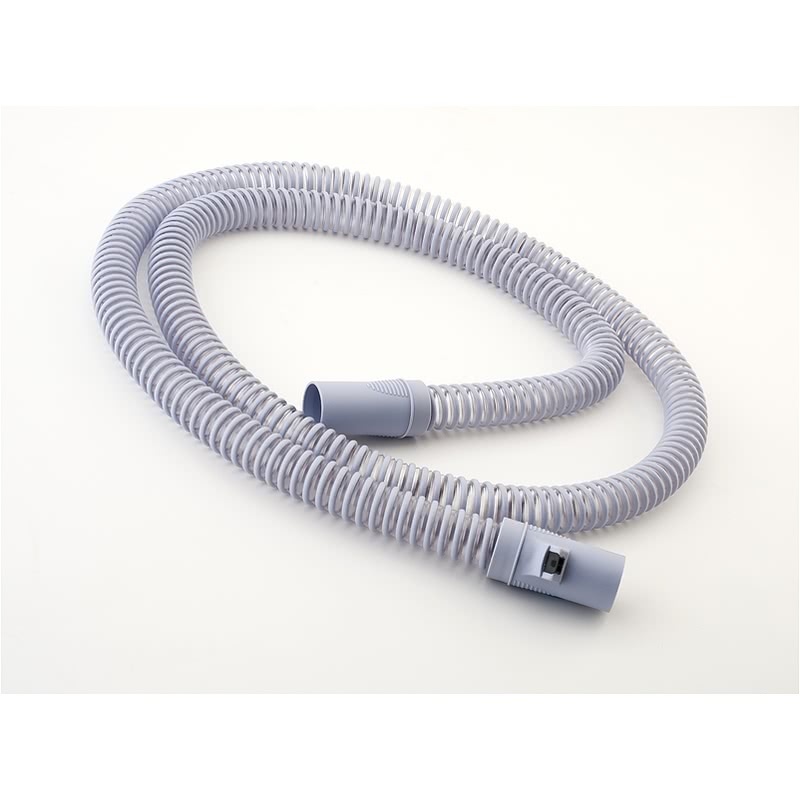 The Hybernite Heated Breathing Tube is 71.25 inches from end to end including cuffs. Both cuff ends are ridged to avoid stress damage to the hose. The diameter of the hose is 19mm. 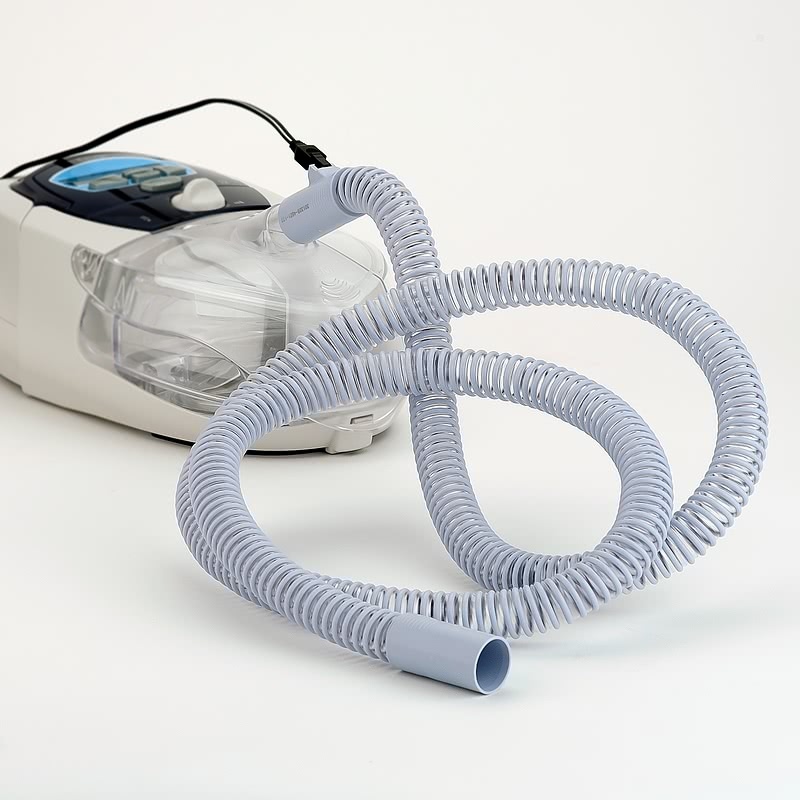 The Hybernite is not compatible with machine lines that use a smaller diameter (15mm) hose such as the S9 series by ResMed and the 60 Series by Philips Respironics. PR System One devices with software Versions EARLIER than 1.24 are not recommended for use with the Hybernite. The version of software flashes on the display screen when the machine is first turned on. Prescription: The Hybernite Rainout Control System and Hybernite Heated Hose require a prescription for purchase. If you don't have a prescription CPAP.com will gladly assist you in getting one. Visit our Prescription Policy for more information or call us at 1-800-356-5221. 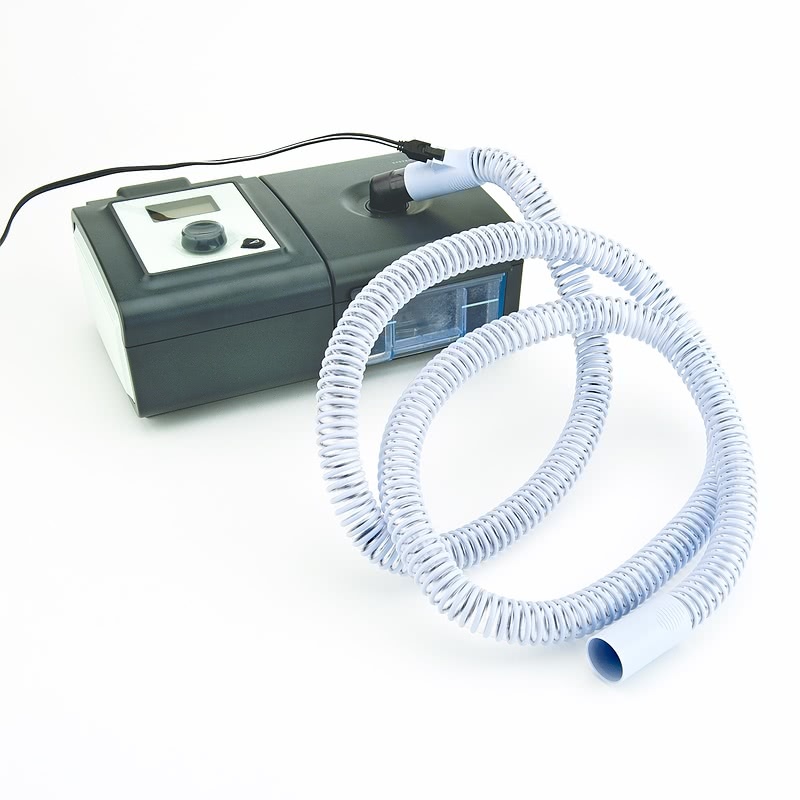 A prescription that contains any of the following words is acceptable to make a purchase of the Hybernite: "Hose"; "Heated Hose"; "Supplies"; "Machine"; "CPAP"; "APAP"; "BiPAP"; "BiLevel"; "VPAP" or "Humidifier"
The components of the Hybernite system are also compatible with the ComfortLine Heated Tubing Kit. For example, the Hybernite tube is compatible with the ComfortLine power supply. Similarly, the ComfortLine tube is compatible with the Hybernite power supply. Power Supply Unit Location: The manufacturer recommends that the Power Supply Unit (PSU) for the Hybernite should be placed on the floor during operation. Humidification Required: The Hybernite Heated Tubing must ALWAYS be used with water humidification to avoid elevated airflow temperatures. Hose and Ambient Temperatures: The Hybernite hose will reach a temperature between 95°F (35°C) and 104°F (40°C) degrees without airflow from the machine. The Hybernite system is recommended to be used in a room with an ambient temperature between 41°F (5°C) and 86°F (30°C). The system should not be used in ambient room temperatures above 86°F (30°C). Hose Covers: It is recommended that an insulated hose cover such as the SnuggleHose or other textile object NOT be used with the Hybernite Heated Tubing to avoid elevated temperatures. Recommended Cleaning & Replacement Schedule: Prior to cleaning the power connection must be disconnected from the tubing. The tubing itself should be washed with mild soap and lukewarm water, then rinsed well, hung and allowed to dry. Tap the electrical connection end of the hose on a hard surface to release any water that could be caught inside. The tubing must be COMPLETELY dry before reconnecting to power. The manufacturer recommends replacing the Heated Tubing after 6 months of use. Warranty: The Power Supply Unit carries a 1 year manufacturer warranty. The Tube carries a 30 day manufacturer warranty. CPAP.com will work with the manufacturer on your behalf. Please contact us at 1-800-356-5221 or by email at cpap@cpap.com.